The veterinarian rubbed Kelly's sides for emphasis. She needs to weight loss. If not ... Peggy Frezon recognized the list of serious ailments that followed. It was the same one her own doctor had given her. 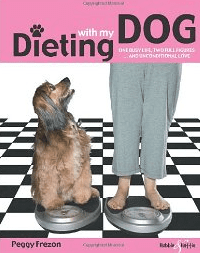 Dieting With My Dog is the honest and heartfelt story of how one overweight woman and her chubby spaniel struggled to get fit and healthy together. Theirs was a comfortable routine. While Frezon's children were flying the nest, her loyal rescue pup snuggled close. Sneaking M&Ms from her secret stash, she would slip Kelly extra doggy cookies too. Why not? Food is love. But then, Kelly became the motivating factor that led Frezon to face down the physical and emotional reasons for her overeating, and for overfeeding her dog. She learned that embracing change is healthy, and everything is easier with unconditional love. Join Frezon and Kelly on their journey to weight loss with a wag. Dieting With My Dog celebrates our close bonds with our pets in times of both need and triumph. This book is for anyone who has ever loved a pet through thick and thin. Features * A heart-warming story of a woman and her dog * Inspirational and motivating * A real-life account * The motivation for getting your dog healthy and happy and living longer * Will encourage YOU to do the same! * Shows how well humans and animals can work together * Heartfelt and humorous look at living with animals * A story of family life and love * Unconditional love in spades! First thing's first, how many diet books are all talk and no substance? Lots, right? Well this one is different. Our author, Peggy, is not only likeable and not at all preachy, as can often be the unpleasant case with many diet books, she actually walks the walk - quite literally. A 40lb weight loss is nothing to sneeze at. Achieving it through the power of a beautiful relationship with your friend and mine, the humble dog. Peggy explains her process and Kelly (the dog) plays along as a virtual four-legged fitness coach throughout the book. Peggy gives us the highs and lows that, I'm sure, many of us have felt during a diet, Kelly keeps her motivated though. The book, while light hearted and breezy, contains some real gasp out loud moments that, I'm sure, will resonate. When Peggy's cousin Judy calls to tell her she'd suffered a heart attack it reminds us that life is fragile and our duty to take care of ourselves and our canine friends is one that we must take seriously, especially as we, and they, get older. Dieting With My Dog is definitely a book that K9 Magazine readers will love. Whether you're in tip top shape or looking to lose a few pounds, the book is a great read and engaging throughout. 'Dieting with My Dog presents delightful incentives to improve health for people and their canine companions. With the book's rare combination of humor, practicality, and inspiration, readers will become motivated to lose weight and gain a special bond with their dog.' -Linda Anderson, co-founder of Angel Animals Network, and co-author of Dogs and the Women Who Love Them, co-author of Animal and the Kids Who Love Them. 'Everyone who has ridden the emotional rollercoaster of weight gain and loss, and struggled with the necessary lifestyle changes, will relate to Peggy's battle and eventual triumph over food's controlling grip. K9 Magazine readers, we do look after you. We’ve got 5 copies of this book to give away to our lucky members. All you have to do to be in with a chance of winning one is tell us the name of Peggy’s dog in the comment form below. The name of the dog is Kelly.